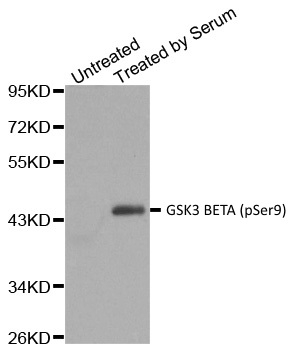 Rabbit anti GSK3 Beta (pSer9) antibody recognizes GSK3 beta when phosphorylated at serine 9. GSK3 is a member of the CMGC family of kinases. GSK3 comprises two isoforms, alpha and beta, with 85% total homology and 98% homology between kinase domains. GSK3 beta is phosphorylated at serine 9 by protein kinase A, AKT and ribosomal S6 kinases p90RSK and p70S6K. Phosphorylation of GSK3 beta at serine 9 leads to inactivation of GSK3 alpha. Antiserum to GSK3 BETA (pSer9) was raised by repeated immunization of rabbits with highly purified antigen. Purified IgG was prepared from whole serum by affinity chromatography.